Ram explains: “As a family, we tried to apply what we learned from the article. After a while, we found that our immune systems were strengthened. Before we began paying attention to our nutrition, we used to catch colds quite often, but now we seldom do. We also learned about economical and easy ways to obtain clean drinking water, thanks to theAwake! article ‘Six Ways to Safeguard Your Health.’”—September 22, 2003. “Another Awake! article helped me to improve the health of my family. It was entitled ‘Soap—A “Do-It-Yourself Vaccine,”’ in the November 22, 2003, issue. We tried the suggestions in this article as soon as we read it. Now we no longer suffer from eye infections as before. Do not give up! Whatever adjustments you need to make, you may experience more success by starting gradually and not setting unreachable goals for yourself. For example, try cutting down on less-healthful foods, rather than cutting them out. Try going to bed a little earlier and getting a little more exercise. Doing something is better than doing nothing. It normally takes time—weeks or months—before a new good habit becomes second nature. In the meantime, if you do not see immediate benefits from your extra efforts, do not despair. If you persist, despite setbacks, your health is likely to improve. In this imperfect world, it is impossible for anyone to attain perfect health. When you get sick, it may be the result, not of negligence on your part, but of inherent human frailty. Therefore, do not let health concerns, or anything else, cause you undue stress and anxiety. Instead, simply try to avoid things that needlessly shorten life and impair its quality. Doing so can help you to enjoy the best health possible! “Everyone shrewd will act with knowledge.” Arming yourself with basic health information can equip and help motivate you to make needed adjustments for better personal and family health. Keep learning. Public and private institutions in many lands provide educational programs and literature on a wide range of health topics. Take advantage of them, and educate yourself about basic ways to improve your health and to avoid endangering it. Keep an open mind, and be willing to make simple adjustments. The good habits you learn and put into practice may well benefit your children and their children after them. When parents set a good example in regard to healthful nutrition, cleanliness, sleep habits, exercise, and disease prevention, their offspring are likely to benefit. What more is needed? It takes more than self-interest to establish and maintain a healthful way of life. Eliminating long-standing bad habits can be daunting, and making even simple adjustments often requires strong motivation. Even the threat of serious illness and death may not move some to do what they know is good for them. What will? Like all of us, they need to keep in mind a higher purpose, or objective, in life. Mates need to remain healthy and strong to continue helping each other. Parents desire to go on supporting and training their children. Grown children need to care for aging relatives. Add to this the noble desire to be a blessing to the community rather than a burden. All of this involves love and concern for others. An even stronger motivation derives from gratitude and devotion to our Maker. If we are healthy, we can serve God more actively. There could be no higher or more motivating reason to take care of one’s health. New APF Long Sleeve & Short Sleeve APF T-Shirts are here! Our hope for the T-shirts is that you all will buy and wear them to help promote and raise questions about Porphyria and to raise funds for the Dr. Packets, pain Management docs, among many other publications we make available at no cost. There are also some copies of Porphyria Live for sale. For information on how to order the T-Shirts and/or the Porphyria Live Video see below. 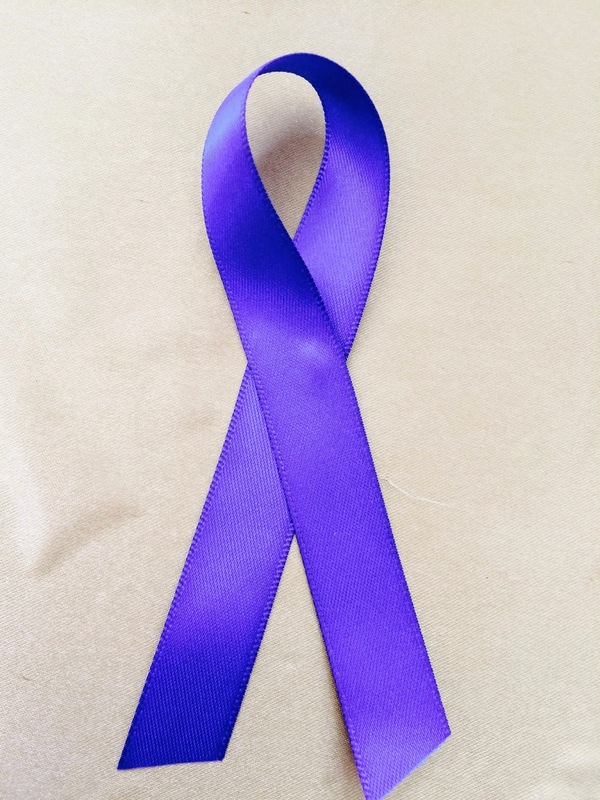 You can order a T-shirt and/or Porphyria Live DVD, Awareness Ribbons & Wristbands by sending an email order to Amy.APF@gmail.com. I must have name, complete address, and phone number. Also include the Quantity of T-shirts and the size for each one. 2}I will accept money orders. You must have name/address/phone # on them. Your information will be kept confidential and never on file, and will be destroyed promptly after each transaction. Address will be supplied after order is received for privacy purposes. T-shirts come in the following sizes S, M, L XL,1xl, 2xl, 3xl they are 100% cotton, heavy not thin, and very durable. No other sizes. The price per T-shirts is 19.00$/shirt. 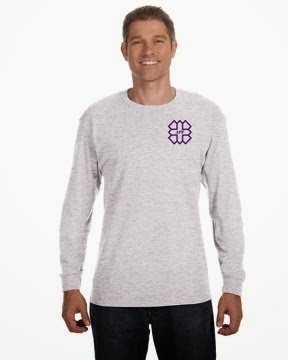 Long sleeve shirts are priced at 25.00$/shirt. This covers the shirt, shipping and tracking, and priority mail. International orders: I will have to consult first with the post office for shipping rates. 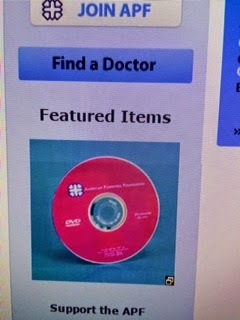 The price of the Porphyria Live DVD is $10.00 each. Shipping is included in the price. See porphyriafoundation.org for content info. 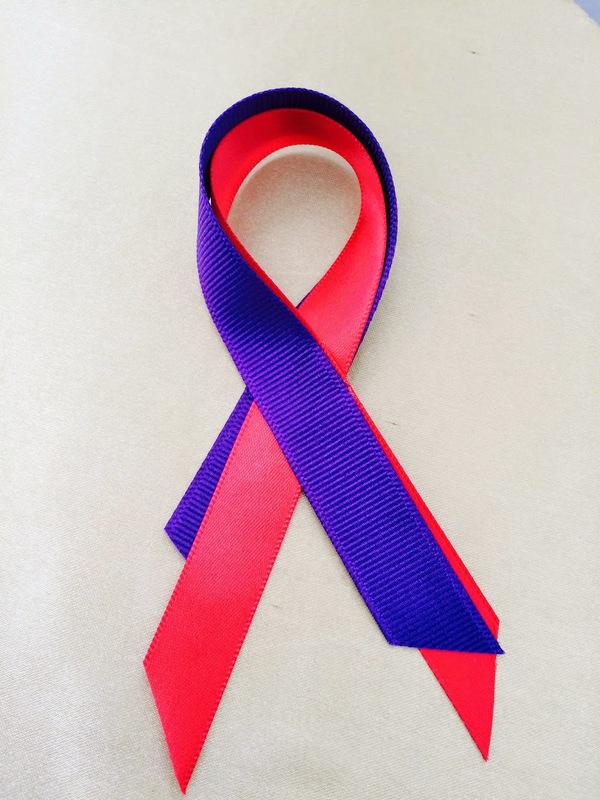 We have Dark Red, Dark Purple, Royal Blue, Mixed Red/Purple they each come with a pin on the back. - Please specify what color you are wanting or I will give assortment per order. If purchasing another APF items there is no extra charge for shipping. 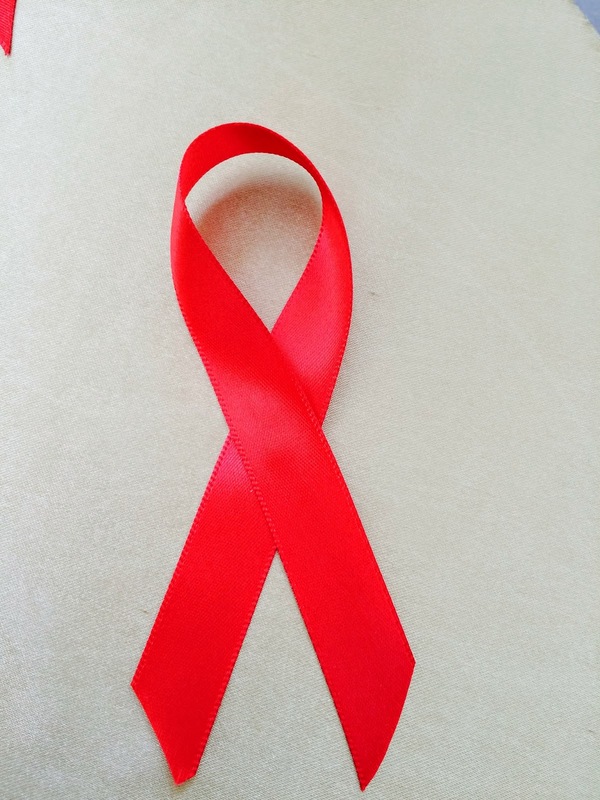 Don’t forget we also have the APF wristbands to match in the same colors as the ribbons. Please specify what color you are wanting or I will give assortment per order. Shipping is 6.00$ for all the wristbands. Merry Christmas and Happy New Year from the APF! We wanted to take this opportunity to wish you all a joyous holiday season. Please, consider volunteering for the research studies currently being conducted. YOU are the KEY to research and RESEARCH is the KEY to your CURE. “Shrewd is the one that has seen the calamity and proceeds to conceal himself.” Taking simple protective steps can help you avoid much sickness and misery, as well as loss of time and money. Keep yourself clean. “Hand washing is the single most important thing that you can do to help prevent the spread of infection and to stay healthy and well,” reports the U.S. Centers for Disease Control and Prevention. As many as 80 percent of infections are said to be passed on by unclean hands. So wash them often throughout the day. Do so especially before eating, preparing food, or dressing or even touching a wound, and do so after touching an animal, using the toilet, or changing a baby’s diaper. Washing with soap and water is more effective than using alcohol-based hand sanitizers. Children stay healthier when parents train them to wash their hands and to keep them away from their mouth and eyes. Bathing every day and keeping your clothes and bed linens fresh and clean also contribute to better health. Keep your home clean. Make whatever extra effort is needed to keep your home tidy and clean, inside and out. Eliminate any places where water can collect and mosquitoes can breed. Litter, filth, and uncovered foods and garbage attract insects and vermin, all of which can bring in microbes and cause disease. If there is no toilet, build a simple latrine rather than just relieving yourself in a field. Cover the latrine to keep out flies, which transmit eye infection and other diseases. This can be the hard part! Jogging, brisk walking, biking, and taking part in active sports—enough both to get your heart beating faster and to cause you to break a sweat—can improve your endurance and help to prevent heart attack and stroke. Combining such aerobic exercise with moderate weight training and calisthenics helps to strengthen your bones, internal muscles, and limbs. These activities also contribute to maintaining a higher metabolism, which automatically helps to control your weight. “No one ever hated his own body: on the contrary, he provides and cares for it.” Taking basic steps to care for yourself can make a world of difference in your health. Get enough rest. “Better is a handful of rest than a double handful of hard work and striving after the wind.” The demands and distractions of modern life have whittled away at the time people spend sleeping. But sleep is essential to good health. Studies show that during sleep our body and brain repair themselves, benefiting memory and mood. Sleep reinforces the immune system and reduces our risk of infection, diabetes, stroke, heart disease, cancer, obesity, depression, and perhaps even Alzheimer’s disease. Rather than artificially bypassing sleepiness—our natural “safety device”—with sweets, caffeine, or other stimulants, we should heed it and simply get some sleep. Most adults need seven to eight hours of sleep every night to look, feel, and perform their best. Young people need more. Sleep-deprived teens are more prone to have psychological troubles and to fall asleep when driving. Sleep is especially important when we are sick. Our body can overcome some illnesses, such as a cold, if we simply get extra sleep and drink plenty of fluids. Take care of your teeth. Brushing your teeth and flossing them after meals, and especially before going to bed, will help ward off tooth decay, gum disease, and tooth loss. Without our own teeth, we may not benefit fully from the food we eat. It is reported that elephants do not die of old age but that they slowly starve to death after their teeth wear down and they can no longer chew properly. Children who have been taught to brush and floss their teeth after eating will enjoy better health in youth and throughout life. Go to the doctor. Some ailments call for professional medical attention. Early diagnosis usually results in a better outcome and less expense. So if you do not feel well, get help to find and eliminate the cause, instead of merely seeking to relieve the symptoms. Tara Cantley is one of the most recent patient volunteers to enroll in the Longitudinal Study, Panhematin Study and the Natural History Study of Acute Liver (Hepatic) Porphyria. The APF flew Tara down to the University of Texas Medical Branch in Galveston, TX to meet with one of the leading experts on porphyria, Dr. Karl Anderson. Tara is excited to be a part of the very important research studies and be able to make a difference and help others. Jessica from the APF was able to go down and visit with Tara while she was admitted to the UTMB hospital. They were able to chat for hours, after that Tara had finished her study requirements for the day. Jessica even had the unique opportunity to meet Dr. Anderson, along with one of Tara's wonderful nurses. Tara and Jessica enjoyed spending time together and it was a great experience for Jessica, who is new to the APF office. Tara understands how important the research studies are for both her and others affected by porphyria. She encourages others to volunteer and wants everyone to know: "Research is the key to our cure!" We would like to thank Tara and all patient volunteers for participating in the research studies! We have a chance to have a treatment to prevent attacks of acute porphyrias (AIP, HCP and VP). However, researchers need You. Without you, we cannot move forward to do research to get the new treatments approved. Safety studies have already been done. You are needed. You will be flown to the research center at No expense to you. You donate your blood and have an exam and fly back home. The first part of the study does NOT include a drug trial. During this part experts study you your attacks and your blood. Then the second part of the study is the drug trial. This study is extremely important to the understanding of porphyria, including why the pain associated with the disease is so severe, and why some people have symptoms and others don't. 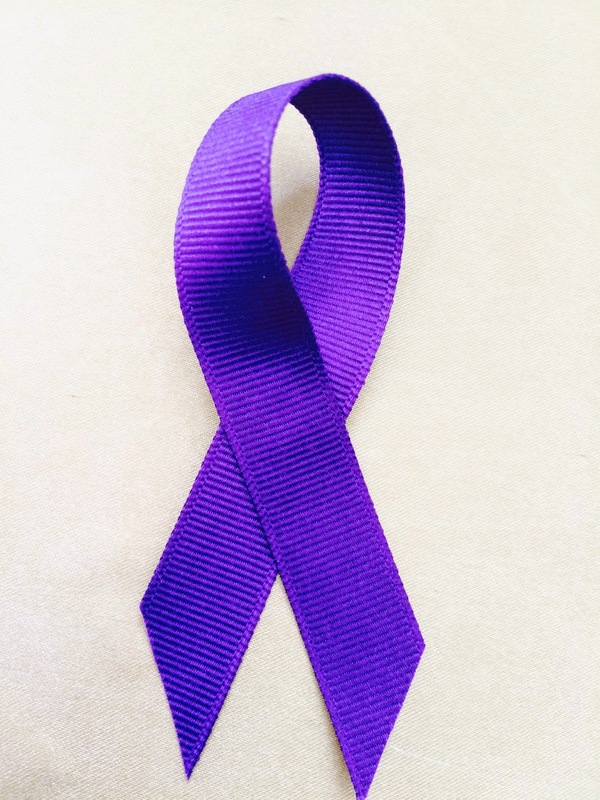 The porphyria research centers are in San Francisco, Birmingham, Galveston, New York City, Salt Lake City, and Wake Forest at University of NC. Become a medical hero. Please help us get a new treatment. Contact the APF office to learn more: 866.APF.3635. “Eat food. Not too much. Mostly plants.” With these few words, author Michael Pollan encapsulates simple, time-tested dietary advice. What does he mean? Eat fresh foods. Concentrate on eating “real” food—whole, fresh foods that people have been enjoying for millenniums—rather than modern processed foods. Commercially prepackaged foods and fast food from chain restaurants usually contain high levels of sugar, salt, and fat, which are associated with heart disease, stroke, cancer, and other serious illnesses. When cooking, try steaming, baking, and broiling instead of frying. Try using more herbs and spices to cut down on salt. Make sure meats are properly cooked, and never eat spoiled food. Do not eat too much. The World Health Organization reports a dangerous worldwide increase in overweight and obese people, often the result of overeating. One study found that in parts of Africa, “there are more children who are overweight than malnourished.” Obese children are at risk of present as well as future health problems, including diabetes. Parents, set a good example for your children by limiting your own portions. Eat mostly plants. A balanced plate favors a variety of fruits, vegetables, and whole grains over meats and starches. Once or twice a week, try substituting fish for meat. Reduce refined foods such as pasta, white bread, and white rice, which have been stripped of much of their nutritional value. But avoid potentially dangerous fad diets. Parents, protect your children’s health by helping them to acquire a taste for foods that are healthful. For example, give them nuts and thoroughly washed fresh fruits and vegetables for snacks instead of chips or candy. In some lands, obtaining clean water can be hard work and is expensive. Yet, drinking it is vital. Tainted water needs to be boiled or chemically treated. Dirty water is said to kill more people than wars or earthquakes; it reportedly kills 4,000 children a day. For infants, the World Health Organization recommends only breast-feeding for the first six months, then breast-feeding plus some other foods until at least the age of two. As the family and holiday times approach many are concerned about their health the foods they eat and what simple measures they can take to ensure that they have good Health. As always please follow up and ask any questions to your Primary Care Doctor, before beginning any changes in diet and daily routine. Whether they are rich or poor, many people fail to see the link between their habits and their health. They may regard enjoying good health as a matter of chance or as something over which they have little control. Such a fatalistic view holds many back from improving their health and leading a more productive life. In the following articles, we will consider five basic keys that have helped Rustam, Ram, and many others. These keys can help you too! Secret #1: When you give, you are likely to get back! People will notice that you are generous. As a result, they’ll probably be generous to you. Secret #2: When you help others, you help yourself! Young people who care about others are everywhere! Consider some examples. “Sometimes when I just want to sit on the couch and watch TV, I think about my mom and dad, who are working, and how tired they are going to be when they come home. So I get up and wash the dishes, vacuum, and dust. I’ll also make a pot of coffee because my parents love coffee. When my mom gets home, she says, ‘Oh, it looks so nice in here! And it smells good too. Thank you so much, Sweetie!’ It always makes me feel good to do something nice like that for my mom and dad.”—Casey. “My parents have always supported me, providing me with everything I need. So when they had a major problem with the car last year, I wrote a check to have it repaired, even though it was a large part of my savings. Of course, they tried to refuse my offer, but I wouldn’t take no for an answer. My parents deserve so much more than even that. And it felt great to be generous and give them something.”—Holly. Did you know? Many young people among Jehovah’s Witnesses have experienced the joy of helping others through their Bible education work. Some have even moved to a foreign land where there is a need for Bible teachers. “I moved from the United States to Mexico to help teach the Bible. Sometimes it’s difficult to be generous with money or things because I don’t really have much to give. But I’ve found that when I give of my time and energy in the ministry, that’s more appreciated than just giving materially.”—Evan. Would you like to experience the joy that comes from helping others? Here are just a few suggestions. Tip: Try to come up with a few ideas of your own. Then make it your goal to help out one person this week. You might be surprised how good you will feel! “When you help others, you end up happy. You feel that you really accomplished something, and you see that others appreciate it. You may have had fun doing it—although at first you didn’t think you would. What you did may not even feel like a sacrifice, because in the end you gained so much.”—Alana. The APF just came back from the 56th ASH Annual Meeting, which was held in San Francisco, CA. More than 20,000 hematologists and health professionals in the field were in attendance. The APF educated physicians, professionals and everyone interested. Also, in a few short months, the APF hosted four patient education meetings. Our last meeting happened last week in conjunction with the ASH convention. The patients had a unique opportunity to meet and hear the presentations given by the porphyria experts: Dr. Bissell, Dr. Phillips and our Protect the Future trainee, Dr. Bruce Wang. We all thank the experts for the donating their time and giving wonderful presentations! We also thank everyone: patients, their family members and friends who attended. We are looking forward to seeing you on our upcoming meetings! We would like to remind you about the HealthWell Foundation, that assists patients living with chronic and life-altering illnesses in paying their share of prescription drug copayments, deductibles, and health insurance premiums.